The SCN application is suitable for the calculation of any load-bearing panel structure or wall-type girder in accordance with the finite elements method. 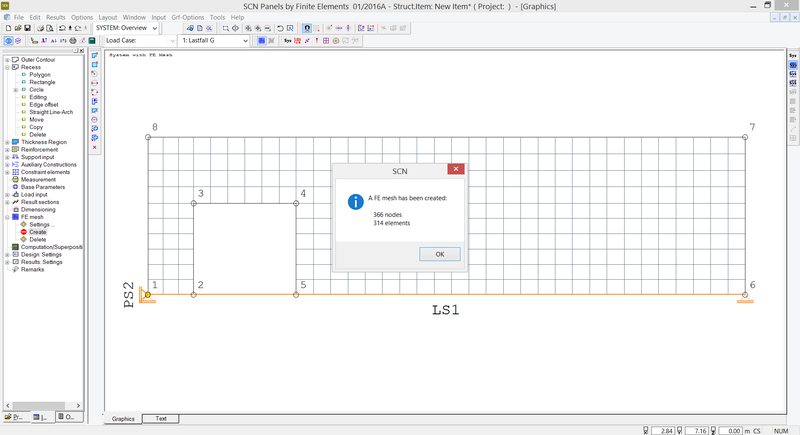 SCN uses the well-known high-performance graphic operating elements of the GEO and PLT applications. Numerous functions allow the fast and efficient han-dling of complex geometries. Fast input of even sophisticated outlines and unlimited editing options and comprehensive functions e.g. The objects of the interactive user interface allow you to generate point or line supports directly. There are several representation options for the bearing reactions of the line supports, either in the form of various diagrams in kN per linear metre or in the form of points along the support axis. For the definition of loads you can select among point and trapezoidal loads in any arrangement. The SCN application includes a fully automatic superposition feature that takes the selected regulation into account. The user can exclude particular load cases from superposition. Each load case is assigned to a group of actions in combination with any standard. On the basis of this assignment, the application calculates the decisive load combinations including the corresponding leading action. You can perform the calculation using alternative load cases. Baumann method. A cracked panel element is used as a model. The design approach assumes an orthogonal mesh reinforcement. All results can be displayed at any grid point or along sections independent of the generated element mesh. Section results can be shown in a separate window as well as in the ground plan. You can also display the results in the form of isolines. Reinforcement data are transferred in an open data format referred to as ASF. The use of these data in the target system is independent of the available system functions. The ASF format allows the transfer of all data produced in the FEM calculation. These data allow the visualisation of all results in the CAD system ALLPLAN.